And he saved Cutter :D .
I felt so sorry for him when I read "In thousands of years". I had no idea that he had been "broken" for so long :( . 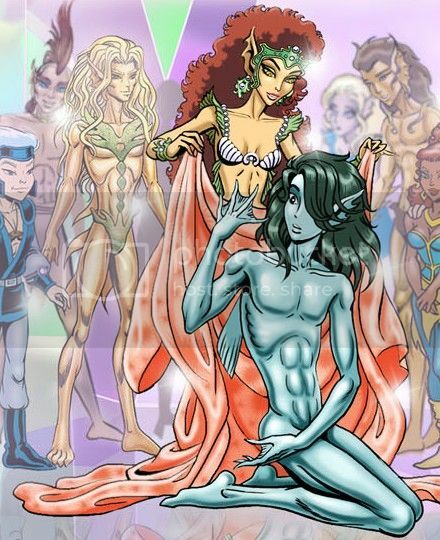 WHAT?They have kept this gorgeous elf in mutated semi fish form for all this time? I really liked that fact that he was still adversely affected by the experience. No 'snap your fingers and he's immediately 100% better' happy ending. I give kudos to Richard and Wendy for that. He is adorable though. Plenty of wavedancers to give him TLC now. aw I'm always late and the first one is that one stolen ?? [color=indigo:634bc562ff]i so agree with you on that Joselle. I felt jipped on it. Yes he is and my favorite of all of the Wavedancer's. ooo... now that would be a fanfic. *bats eyes at Kitt* I would do it, but my writing skills have died on me. You know, Shenshen isent a bad choise for reef, but i think he should recognize Vurdah (thats the name of one of Skywises trio lovemates, right? I always remember ruffel and maleen, but not so sure about the third). Why do i think Vurdah is better for reef? Because when reef speaks the words kindness, Vurdah is the first elf to pop onto my head. And just think, no one would be more kind and loving for reef. She wants and deserves a child. He's hot after being healed, I agree. the major characters don't strike the eye after a while. Not that they aren't always beautiful. I like that you had Timmain go out to collect him. behind the scenes, unnoticed when she wants to be. PS: Glad you liked my Reef picture! Thanks, Nightsea. :D Frankly, I couldn't see who else could get the Broken One to enter the Palace without his kicking up a fuss. up looking like him anyway, yes? 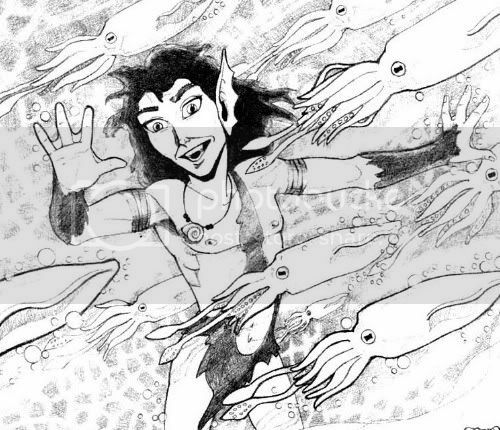 Here is a close-up of Reef, from the 2007 Fan Art Calendar. As I said in another thread, I felt Reef belonged in the Circle of Elders not because he is the oldest Wavedancer, as he probably isn't. But because, after all he has been through, I think he has the potential of being the wisest of the Wavedancers - someone who has seen and lived the darkest side of life, but now can bring a simple, almost child-like clarity and trial-tested compassion to his gift of being a Healer. He is! And he looks so peaceful now. [quote:3757390f54="Windrider"] I think he has the potential of being the wisest of the Wavedancers - someone who has seen and lived the darkest side of life, but now can bring a simple, almost child-like clarity and trial-tested compassion to his gift of being a Healer. Very well put, Windrider. I think that waht he has been through might make him want to really work on his healing abilities to be able to help others. Reef is one of my EQ darlings-I can identify with him, not that I&apos;ve been broken, but struggling with overweight, body-image and self-esteem. So we&apos;re alike there. And, as I&apos;ve said in another thread, he reminds me alot of one my favourite musician, Tuomas Holopainen, who&aposs sensitive, fought with a bad self-esteem and pain-plus refering to himself as an "Ocean soul". Posted a picture of him below-a little "Reefy" isn't he? He has cool hair! And he's cute and shy. I not sure, but wasn't his mind somewhat damaged? He seemed to gone back to have a childlike mind in the end. He may not hate her but he sure seemed Glad she was no longer alive and around to threaten him. Looks like little Korafay will be playing a role in truly healing his heart. The Elder, who must rediscover his world and his self - and the newborn, just starting this journey - a charming, touching pair. Why does this picture make me think, Reef an Korafay will recognize? This one, not those where they interact ... Just an impression without any special reason - so strange that I had to speak it out loud. That would be so cool if it happened! He sure looks happy about something in that picture. It's nice to see him happy. No! No! You guys! Stop messing it up! He's gonna three-mate with Sunstream and Brill and be the World (of two moons)'s coolest secondary daddy! The future isn't written yet ... The only thing that seems to be pretty sure is that Reef will have a more important role in the TFQ. He will find his place. Are those arm-wings like Korafay's? oh my god, if he was real, I would have been in love! So glad to see him in final quest! I fell in love with him even more! Brill replies: Mist in the mind over "how long?" and "ever been?" Always... always the twirling/swirlings (note: she means joinings). Never "no" to any dance - even Broken One/Reef - but, too sad, he said no. Many "yes-es" now, happy Reef! I believe that's basically a sign that I'm right! I know I'm late to the game, but after years of being away from EQ I just read Discovery and the Prologue last week, and I agree that Reef is mighty intriguing! Not to mention damn cute. Sadly, the link to the fic "Broken No More" is itself broken. :-( Does that fic still exist anywhere? Here it is, Sarah - post #26. Enjoy! Thanks for posting the fic, Embala! I was curious to read it, too. Cool story! I thought he was a pretty intriguing character (hence the avatar ). I'm interested to see if Reef gets much to do in the Last Quest, or if he just ends up being one of those characters with a good back story but who doesn't end up in the main narrative much. Guess we'll see! Some of us would bet Reef will get a more prominent role. Hey guys! 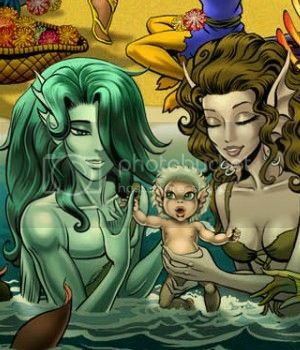 Just wanna say that even though there's nothing in the Final Quest Special that clearly states that Reef is in a three-mating with Sunstream and Brill, nor is there anything stating that he isn't! I love Reef. Hes so handsome. is his incomplete healing the reason why he's blue? 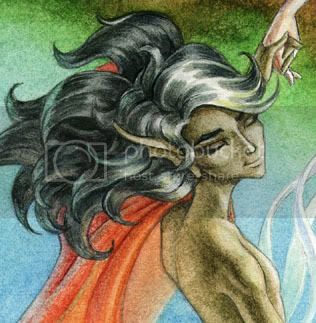 I got the impression that Wavedancers simply are more colorful than other elves - and in another way. Wavedancers have an extended palette of haircolors, too. Edit: And Sunstream's Wavedancer shape is golden and red and blue like a coral fish. Probably to blend in better with water. Maybe one of the things that draw Reef to Korafay is the fact that she's the only one to whom he's always simply been Reef not Reef - the Broken One. RedheadEmber said: Maybe one of the things that draw Reef to Korafay is the fact that she's the only one to whom he's always simply been Reef not Reef - the Broken One. A good thought! You are probably right! Raenafel said: is his incomplete healing the reason why he's blue? He's blue because he's sad. Maybe he has always been blue? Any way it suits him. Wasn't it mentioned that Reef was/is a healer before he had the run in with Winnie? It was ... according to the Wavedancers storyline the fact he was a healer was a major reason of his sad fate. I agree I think it's all part of his future story.....he's a great character! I don't think his powers will return. Once, looooooooong ago, Wendy mentioned something about thinking the Wavedancers already have way too many healers. But of course; most other tribes have somewhere between zero and one healer.